How do you spot a meth lab? Most of us don’t even think about your rented property or new home ever being used as a meth lab. However did you know statistics show the use of short-term rented accommodation and warehouses for making meth is on the rise and shows no signs of stopping? 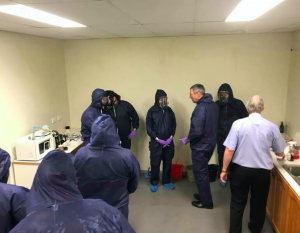 Here at PHJ Services, we are experienced in Meth lab Clean up and have even seen situations where properties have been used for this purpose; and knowing neighbours have been frightened to raise it with local authorities because they feel their safety is at risk. So do you know how to tell if your property has been used as a Meth lab? In this blog, we take you through 15 tell-tale signs that it has. #15 How to spot a meth lab – Empty Chemical drums or containers – making meth requires the use of chemicals – these often come in drums or specially marked chemical containers. If these are left lying around, this is another good sign that your house, apartment or warehouse may have been used as a meth lab. Here at PHJ Services we are professional, certified meth lab cleaners on the Gold Coast. It is very important to get the professionals in because if not done properly the bi-products are cancer causing, can damage organs, give birth defects to unborn children, could induce severe headaches or other health issues. We have been trained in safe Meth Lab clean up and can help you.